It is that time of year again. You know, when we are all supposed to be overwhelmed with holiday cheer and goodwill toward our fellow man and whatnot. But, between figuring out what to get everyone, when we are actually going to do that shopping, and then finding more time to wrap those gifts, you have no time. Oh and don't forget baking cookies for Santa, and the parties you have to attend or host, and decorations (indoors and out), and keeping the kids out of said decorations. Of course, the regular housework isn't going to do itself in the meantime either. There is ALWAYS two loads of laundry in my house. Even if I just did two. I swear. Yay for holidays, right? Alright, having a newborn and another kid under two may mean I am a bit more bah-humbug than normal about all the to-dos that go along with the Christmas season this year. But, I have found a way to unwind at the end of a busy day, that has me feeling more cheery. I have to credit this idea from a drink I had at the Dogfish Head Brew Pub in Delaware. It was a dreary and cold day, and I not only wanted something to warm me up, but I also wanted to take advantage of my kid free afternoon with an adult beverage. 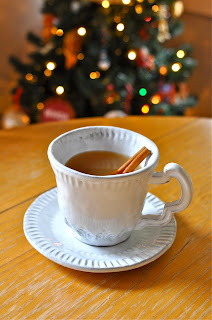 Enter the cinnamon infused vodka apple cider. Yep, you read that right. And yes, it is as good as it sounds. Upon returning home I thought I would give it a try. I infused my own vodka by simply placing three cinnamon sticks in a bottle and letting it set for a week, shaking it at least once a day. I then placed a good portion (the holidays are the time to indulge, right?) in a mug and topped it with freshly brewed cider. Needless to say, after a warm cup of this concoction I am feeling the holiday spirit once again. Of course, I won't say it has improved my wrapping skills. Its the thought that counts anyway, right? Oh well, cheers everyone! Thanks for the kind comments, Mary! Glad you found the site.